We reached Puerto Cortez (N15.49, W087.55) the following night - held up by some unfavorable wind conditions. Dave had already informed the navy who was running a travel lift. 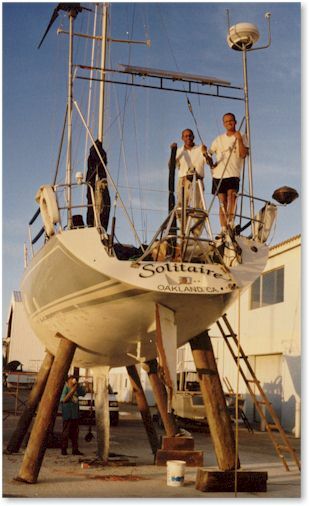 It took less than 30 minutes to take 'Solitaire' out of the water the next morning. This apparently was not 'Manjana Land'. 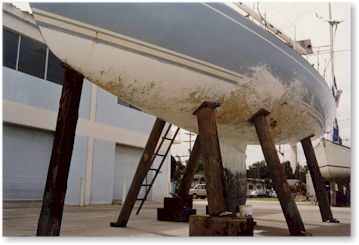 Right on time before the next Norther hit, we had the ship on solid ground and inspected for repair. Steve is expecting it to be done within the next three months. In the mean time he might become a cruiser himself. The pace might be more healthy and his Spanish will certainly benefit as well. Si, Senor! My flight to Frankfurt leaves in 4 days. I know I am looking forward to coming back home. Who knows if I will get back to cruising again one day. I got home safely and started to integrate myself back into my "normal life" on solid land. It took several weeks and many rounds of telling my story to start putting it behind me. Up to today there's still an occasional moment in which I feel being back on 'Solitaire' screaming on her side on that reef somewhere far off the coast of Honduras in the middle of the night. Steve and I on our last evening together in Puerto Cortez. Yet, a year later I returned aboard 'Solitaire' to join Steve on his way across the Mediterranean. After repairing the ship for several months in Puerto Cortez, he completed his trip to Cuba and then went on to cross the Atlantic and continued his circum navigation. I rejoined him from Barcelona to Tunis on two beautiful weeks of sailing via Majorca and Sardinia and found out that 'Solitaire' was back in shape and that she obviously had put her first rough days in the Caribbean Sea far behind her. Steve by now has finished his cruise around the world. He returned to Oakland in early 2003. Check out our aftermath and find out what went wrong.